Surgeons perform laparoscopic stomach surgery. 2 from leaking). Over one million cholecystectomies are performed in the U.S. annually, with over 96% of those being performed laparoscopically. Rather than a minimum 20 cm incision as in traditional (open) cholecystectomy, four incisions of 0.5–1.0 cm, or more recently a single incision of 1.5–2.0 cm, will be sufficient to perform a laparoscopic removal of a gallbladder. Since the gallbladder is similar to a small balloon that stores and releases bile, it can usually be removed from the abdomen by suctioning out the bile and then removing the deflated gallbladder through the 1 cm incision at the patient's navel. The length of postoperative stay in the hospital is minimal, and same-day discharges are possible in cases of early morning procedures. In certain advanced laparoscopic procedures, where the size of the specimen being removed would be too large to pull out through a trocar site (as would be done with a gallbladder), an incision larger than 10 mm must be made. The most common of these procedures are removal of all or part of the colon (colectomy), or removal of the kidney (nephrectomy). 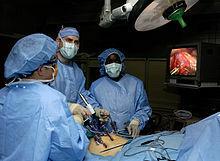 Some surgeons perform these procedures completely laparoscopically, making the larger incision toward the end of the procedure for specimen removal, or, in the case of a colectomy, to also prepare the remaining healthy bowel to be reconnected (create an anastomosis). Many other surgeons feel that since they will have to make a larger incision for specimen removal anyway, they might as well use this incision to have their hand in the operative field during the procedure to aid as a retractor, dissector, and to be able to feel differing tissue densities (palpate), as they would in open surgery. This technique is called hand-assist laparoscopy. Since they will still be working with scopes and other laparoscopic instruments, CO2 will have to be maintained in the patient's abdomen, so a device known as a hand access port (a sleeve with a seal that allows passage of the hand) must be used. Surgeons who choose this hand-assist technique feel it reduces operative time significantly versus the straight laparoscopic approach. It also gives them more options in dealing with unexpected adverse events (e.g., uncontrolled bleeding) that may otherwise require creating a much larger incision and converting to a fully open surgical procedure. Conceptually, the laparoscopic approach is intended to minimise post-operative pain and speed up recovery times, while maintaining an enhanced visual field for surgeons. Due to improved patient outcomes, in the last two decades, laparoscopic surgery has been adopted by various surgical sub-specialties, including gastrointestinal surgery (including bariatric procedures for morbid obesity), gynecologic surgery, and urology. Based on numerous prospective randomized controlled trials, the approach has proven to be beneficial in reducing post-operative morbidities such as wound infections and incisional hernias (especially in morbidly obese patients), and is now deemed safe when applied to surgery for cancers such as cancer of colon. The restricted vision, the difficulty in handling of the instruments (new hand-eye coordination skills are needed), the lack of tactile perception, and the limited working area are factors adding to the technical complexity of this surgical approach. For these reasons, minimally invasive surgery has emerged as a highly competitive new sub-specialty within various fields of surgery. Surgical residents who wish to focus on this area of surgery gain additional laparoscopic surgery training during one or two years of fellowship after completing their basic surgical residency. 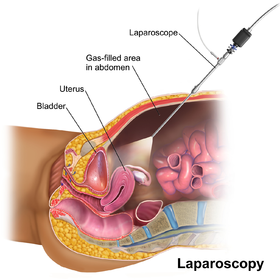 In OB-GYN residency programs, the average laparoscopy-to-laparotomy quotient (LPQ) is 0.55. Laparoscopic techniques have also been developed in the field of veterinary medicine. Due to the relative high cost of the equipment required, however, it has not become commonplace in most traditional practices today but rather limited to specialty-type practices. Many of the same surgeries performed in humans can be applied to animal cases – everything from an egg-bound tortoise to a German Shepherd can benefit from MIS. A paper published in JAVMA (Journal of the American Veterinary Medical Association) in 2005 showed that dogs spayed laparoscopically experienced significantly less pain (65%) than those that were spayed with traditional "open" methods. Arthroscopy, thoracoscopy, cystoscopy are all performed in veterinary medicine today. The University of Georgia School of Veterinary Medicine and Colorado State University's School of Veterinary Medicine are two of the main centers where veterinary laparoscopy got started and have excellent training programs for veterinarians interested in getting started in MIS. There are more indications for laparoscopic surgery in gastrointestinal emergencies as the field develops. Although laparoscopy in adult age group is widely accepted, its advantages in pediatric age group is questioned. Benefits of laparoscopy appears to recede with younger age. Efficacy of laparoscopy is inferior to open surgery in certain conditions such as pyloromyotomy for Infantile hypertrophic pyloric stenosis. Although laparoscopic appendectomy has lesser wound problems than open surgery, the former is associated with more intra-abdominal abscesses. The surgeon has a limited range of motion at the surgical site, resulting in a loss of dexterity. Surgeons must use tools to interact with tissue rather than manipulate it directly with their hands. This results in an inability to accurately judge how much force is being applied to tissue as well as a risk of damaging tissue by applying more force than necessary. This limitation also reduces tactile sensation, making it more difficult for the surgeon to feel tissue (sometimes an important diagnostic tool, such as when palpating for tumors) and making delicate operations such as tying sutures more difficult. The tool endpoints move in the opposite direction to the surgeon's hands due to the pivot point, making laparoscopic surgery a non-intuitive motor skill that is difficult to learn. This is called the fulcrum effect. Some surgeries (carpal tunnel for instance) generally turn out better for the patient when the area can be opened up, allowing the surgeon to see "the whole picture" surrounding physiology, to better address the issue at hand. In this regard, keyhole surgery can be a disadvantage. The most significant risks are from trocar injuries during insertion into the abdominal cavity, as the trocar is typically inserted blindly. Injuries include abdominal wall hematoma, umbilical hernias, umbilical wound infection, and penetration of blood vessels or small or large bowel. The risk of such injuries is increased in patients who have a low body mass index or have a history of prior abdominal surgery. While these injuries are rare, significant complications can occur, and they are primarily related to the umbilical insertion site. Vascular injuries can result in hemorrhage that may be life-threatening. Injuries to the bowel can cause a delayed peritonitis. It is very important that these injuries be recognized as early as possible. There may be an increased risk of hypothermia and peritoneal trauma due to increased exposure to cold, dry gases during insufflation. The use of surgical humidification therapy, which is the use of heated and humidified CO2 for insufflation, has been shown to reduce this risk. Many patients with existing pulmonary disorders may not tolerate pneumoperitoneum (gas in the abdominal cavity), resulting in a need for conversion to open surgery after the initial attempt at laparoscopic approach. 2 introduced into the abdominal cavity is removed through the incisions during surgery. Gas tends to rise, and when a pocket of CO2 rises in the abdomen, it pushes against the diaphragm (the muscle that separates the abdominal from the thoracic cavities and facilitates breathing), and can exert pressure on the phrenic nerve. This produces a sensation of pain that may extend to the patient's shoulders. For an appendectomy, the right shoulder can be particularly painful. In some cases this can also cause considerable pain when breathing. In all cases, however, the pain is transient, as the body tissues will absorb the CO2 and eliminate it through respiration. Coagulation disorders and dense adhesions (scar tissue) from previous abdominal surgery may pose added risk for laparoscopic surgery and are considered relative contra-indications for this approach. Intra-abdominal adhesion formation is a risk associated with both laparoscopic and open surgery and remains a significant, unresolved problem. Adhesions are fibrous deposits that connect tissue to organ post surgery. Generally, they occur in 50-100% of all abdominal surgeries, with the risk of developing adhesions being the same for both procedures. Complications of adhesions include chronic pelvic pain, bowel obstruction, and female infertility. In particular, small bowel obstruction poses the most significant problem. The use of surgical humidification therapy during laparoscopic surgery may minimise the incidence of adhesion formation. Other techniques to reduce adhesion formation include the use of physical barriers such as films or gels, or broad-coverage fluid agents to separate tissues during healing following surgery. 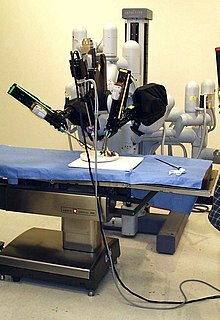 A laparoscopic robotic surgery machine. There has been a distinct lack of disclosure regarding nano-scale developments in keyhole surgery and remote medicine, a "disparity of disclosure" which does not correlate with the rapid advancements in both the medical and nanotechnology fields over the last two decades. There are also user-friendly non robotic assistance systems that are single hand guided devices with a high potential to save time and money. These assistance devices are not bound by the restrictions of common medical robotic systems. The systems enhance the manual possibilities of the surgeon and his/her team, regarding the need of replacing static holding force during the intervention. The stabilisation of the camera picture because the whole static workload is conveyed by the assistance system. Some systems enable a fast repositioning and very short time for fixation of less than 0.02 seconds at the desired position. Some systems are lightweight constructions (18 kg) and can withstand a force of 20 N in any position and direction. The benefit – a physically relaxed intervention team can work concentrated on the main goals during the intervention. The potentials of these systems enhance the possibilities of the mobile medical care with those lightweight assistance systems. These assistance systems meet the demands of true solo surgery assistance systems and are robust, versatile, and easy to use. With laparoscopy providing tissue diagnosis, and helping to achieve the final diagnosis without any significant complication and less operative time, it can be safely concluded that diagnostic laparoscopy is a safe, quick, and effective adjunct to non‑surgical diagnostic modalities, for establishing a conclusive diagnosis, but whether it will replace imaging studies as a primary modality for diagnosis needs more evidence. In the ensuing several decades, numerous individuals refined and popularized the approach further for laparoscopy. The advent of computer chip-based television cameras was a seminal event in the field of laparoscopy. This technological innovation provided the means to project a magnified view of the operative field onto a monitor and, at the same time, freed both the operating surgeon's hands, thereby facilitating performance of complex laparoscopic procedures. Prior to its conception, laparoscopy was a surgical approach with very few applications, mainly for purposes of diagnosis and performance of simple procedures in gynecologic applications. 2 hysteroscopy from the mid-1970s. In 1972, Clarke invented, published, patented, presented, and recorded on film laparoscopic surgery, with instruments marketed by the Ven Instrument Company of Buffalo, New York. In 1975, Tarasconi, from the Department of Ob-Gyn of the University of Passo Fundo Medical School (Passo Fundo, RS, Brazil), started his experience with organ resection by laparoscopy (Salpingectomy), first reported in the Third AAGL Meeting, Hyatt Regency Atlanta, November 1976 and later published in The Journal of Reproductive Medicine in 1981. This laparoscopic surgical procedure was the first laparoscopic organ resection reported in medical literature. In 1981, Semm, from the gynecological clinic of Kiel University, Germany, performed the first laparoscopic appendectomy. Following his lecture on laparoscopic appendectomy, the president of the German Surgical Society wrote to the Board of Directors of the German Gynecological Society suggesting suspension of Semm from medical practice. Subsequently, Semm submitted a paper on laparoscopic appendectomy to the American Journal of Obstetrics and Gynecology, at first rejected as unacceptable for publication on the grounds that the technique reported on was "unethical," but finally published in the journal Endoscopy. The abstract of his paper on endoscopic appendectomy can be found at here. Semm established several standard procedures that were regularly performed, such as ovarian cyst enucleation, myomectomy, treatment of ectopic pregnancy and finally laparoscopic-assisted vaginal hysterectomy (nowadays termed as cervical intra-fascial Semm hysterectomy). He also developed a medical instrument company Wisap in Munich, Germany, which still produces various endoscopic instruments of high quality. In 1985, he constructed the pelvi-trainer = laparo-trainer, a practical surgical model whereby colleagues could practice laparoscopic techniques. Semm published over 1000 papers in various journals. He also produced over 30 endoscopic films and more than 20,000 colored slides to teach and inform interested colleagues about his technique. His first atlas, More Details on Pelviscopy and Hysteroscopy was published in 1976, a slide atlas on pelviscopy, hysteroscopy, and fetoscopy in 1979, and his books on gynecological endoscopic surgery in German, English, and many other languages in 1984, 1987, and 2002. In 1985, Erich Mühe performed the first laparoscopic cholecystectomy. Afterward, laparoscopy gained rapidly acceptance for non-gynecologic applications. Prior to Mühe, the only specialty performing laparoscopy on a widespread basis was gynecology, mostly for relatively short, simple procedures such as a diagnostic laparoscopy or tubal ligation. The introduction in 1990 of a laparoscopic clip applier with twenty automatically advancing clips (rather than a single load clip applier that would have to be taken out, reloaded and reintroduced for each clip application) made general surgeons more comfortable with making the leap to laparoscopic cholecystectomies (gall bladder removal). On the other hand, some surgeons continue to use the single clip appliers as they save as much as $200 per case for the patient, detract nothing from the quality of the clip ligation, and add only seconds to case lengths. 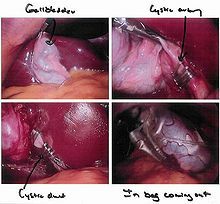 It must be noted that both laparoscopy tubal ligations and cholecystectomies may be performed using suturing and tying, thus further reducing the expensive cost of single and multiclips (when compared to suture). Once again this may increase case lengths but costs are greatly reduced (ideal for developing countries) and widespread accidents of loose clips are eliminated. In gynecology, diagnostic laparoscopy may be used to inspect the outside of the uterus, ovaries, and fallopian tubes, as, for example, in the diagnosis of female infertility. Usually, one incision is placed near the navel and a second near the pubic hairline. A special type of laparoscope called a fertiloscope, which is modified for transvaginal application, can be used. A dye test may be performed to detect any blockage in the reproductive tract, wherein a dark blue dye is passed up through the cervix and is followed with the laparoscope through its passage out into the fallopian tubes to the ovaries. ^ Stephen W, Eubanks S, Lee L, Swanstrom LL, Soper NJ, eds. (2004). Mastery of Endoscopic and Laparoscopic Surgery (2nd ed.). Lippincott Williams & Wilkins. ISBN 978-0781744454. ^ "Training in diagnostic laparoscopy". Gfmer.ch. Archived from the original on July 14, 2014. Retrieved October 10, 2013. ^ Bhandarkar D, Mittal G, Shah R, Katara A, Udwadia TE (January 2011). "Single-incision laparoscopic cholecystectomy: How I do it?". Journal of Minimal Access Surgery. 7 (1): 17–23. doi:10.4103/0972-9941.72367. PMC 3002000. PMID 21197237. ^ Kaban GK, Czerniach DR, Litwin DE, Litwin DE (2003). "Hand-assisted laparoscopic surgery". Surgical Technology International. 11: 63–70. PMID 12931285. ^ a b Shabanzadeh DM, Sørensen LT (December 2012). "Laparoscopic surgery compared with open surgery decreases surgical site infection in obese patients: a systematic review and meta-analysis". Annals of Surgery. 256 (6): 934–45. doi:10.1097/SLA.0b013e318269a46b. PMID 23108128. ^ Ma Y, Yang Z, Qin H, Wang Y (December 2011). "A meta-analysis of laparoscopy compared with open colorectal resection for colorectal cancer". Medical Oncology. 28 (4): 925–33. doi:10.1007/s12032-010-9549-5. PMID 20458560. ^ Devitt CM, Cox RE, Hailey JJ (September 2005). "Duration, complications, stress, and pain of open ovariohysterectomy versus a simple method of laparoscopic-assisted ovariohysterectomy in dogs". Journal of the American Veterinary Medical Association. 227 (6): 921–7. doi:10.2460/javma.2005.227.921. PMID 16190590. ^ "MIS Procedures". vet.uga.edu. Retrieved 2019-01-26. ^ "Surgical Endoscopy". csu-cvmbs.colostate.edu. Retrieved 2019-01-26. ^ Wang S, Shi N, You L, Dai M, Zhao Y (December 2017). "Minimally invasive surgical approach versus open procedure for pancreaticoduodenectomy: A systematic review and meta-analysis". Medicine. 96 (50): e8619. doi:10.1097/MD.0000000000008619. PMC 5815671. PMID 29390259. ^ a b Li H, Zheng J, Cai JY, Li SH, Zhang JB, Wang XM, Chen GH, Yang Y, Wang GS (November 2017). "VS open hepatectomy for hepatolithiasis: An updated systematic review and meta-analysis". World Journal of Gastroenterology. 23 (43): 7791–7806. doi:10.3748/wjg.v23.i43.7791. PMC 5703939. PMID 29209120. ^ a b Yi X, Chen S, Wang W, Zou L, Diao D, Zheng Y, He Y, Li H, Luo L, Xiong W, Wan J (August 2017). "A Systematic Review and Meta-Analysis of Laparoscopic and Open Distal Pancreatectomy of Nonductal Adenocarcinomatous Pancreatic Tumor (NDACPT) in the Pancreatic Body and Tail". Surgical Laparoscopy, Endoscopy & Percutaneous Techniques. 27 (4): 206–219. doi:10.1097/SLE.0000000000000416. PMID 28520652. ^ a b Zhang CD, Chen SC, Feng ZF, Zhao ZM, Wang JN, Dai DQ (August 2013). "Laparoscopic versus open gastrectomy for early gastric cancer in Asia: a meta-analysis". Surgical Laparoscopy, Endoscopy & Percutaneous Techniques. 23 (4): 365–77. doi:10.1097/SLE.0b013e31828e3e6e. PMID 23917592. ^ Tan S, Wu G, Zhuang Q, Xi Q, Meng Q, Jiang Y, Han Y, Yu C, Yu Z, Li N (September 2016). "Laparoscopic versus open repair for perforated peptic ulcer: A meta analysis of randomized controlled trials". International Journal of Surgery. 33 Pt A: 124–32. doi:10.1016/j.ijsu.2016.07.077. PMID 27504848. ^ Silecchia G, Campanile FC, Sanchez L, Ceccarelli G, Antinori A, Ansaloni L, Olmi S, Ferrari GC, Cuccurullo D, Baccari P, Agresta F, Vettoretto N, Piccoli M (September 2015). "Laparoscopic ventral/incisional hernia repair: updated Consensus Development Conference based guidelines [corrected]". Surgical Endoscopy. 29 (9): 2463–84. doi:10.1007/s00464-015-4293-8. PMID 26139480. ^ Jimenez Rodriguez RM, Segura-Sampedro JJ, Flores-Cortés M, López-Bernal F, Martín C, Diaz VP, Ciuro FP, Ruiz JP (March 2016). "Laparoscopic approach in gastrointestinal emergencies". World Journal of Gastroenterology. 22 (9): 2701–10. doi:10.3748/wjg.v22.i9.2701. PMC 4777993. PMID 26973409. ^ Gosemann JH, Lange A, Zeidler J, Blaser J, Dingemann C, Ure BM, Lacher M (August 2016). "Appendectomy in the pediatric population-a German nationwide cohort analysis". Langenbeck's Archives of Surgery. 401 (5): 651–9. doi:10.1007/s00423-016-1430-3. PMID 27118213. ^ Kane TD, Brown MF, Chen MK (May 2009). "Position paper on laparoscopic antireflux operations in infants and children for gastroesophageal reflux disease. American Pediatric Surgery Association". Journal of Pediatric Surgery. 44 (5): 1034–40. doi:10.1016/j.jpedsurg.2009.01.050. PMID 19433194. ^ Raveenthiran V (October 2010). "Pediatric laparoscopy: Facts and factitious claims". Journal of Indian Association of Pediatric Surgeons. 15 (4): 122–8. doi:10.4103/0971-9261.72434. PMC 2995935. PMID 21170193. ^ Westebring-van der Putten EP, Goossens RH, Jakimowicz JJ, Dankelman J (2008). "Haptics in minimally invasive surgery--a review". Minimally Invasive Therapy & Allied Technologies. 17 (1): 3–16. doi:10.1080/13645700701820242. PMID 18270873. ^ Gallagher AG, McClure N, McGuigan J, Ritchie K, Sheehy NP (September 1998). "An ergonomic analysis of the fulcrum effect in the acquisition of endoscopic skills". Endoscopy. 30 (7): 617–20. doi:10.1055/s-2007-1001366. PMID 9826140. ^ Mayol J, Garcia-Aguilar J, Ortiz-Oshiro E, De-Diego Carmona JA, Fernandez-Represa JA (June 1997). "Risks of the minimal access approach for laparoscopic surgery: multivariate analysis of morbidity related to umbilical trocar insertion". World Journal of Surgery. 21 (5): 529–33. doi:10.1007/PL00012281. PMID 9204743. ^ Mirhashemi R, Harlow BL, Ginsburg ES, Signorello LB, Berkowitz R, Feldman S (September 1998). "Predicting risk of complications with gynecologic laparoscopic surgery". Obstetrics and Gynecology. 92 (3): 327–31. doi:10.1016/S0029-7844(98)00209-9. PMID 9721764. ^ Fuller J, Scott W, Ashar B, Corrado J. "Laparoscopic Trocar Injuries". A report from a U.S. Food and Drug Administration (FDA) Center for Devices and Radiological Health (CDRH) Systematic Technology Assessment of Medical Products (STAMP) Committee. Archived from the original on 7 April 2007. ^ Alexander JI, Hull MG (March 1987). "Abdominal pain after laparoscopy: the value of a gas drain". British Journal of Obstetrics and Gynaecology. 94 (3): 267–9. doi:10.1111/j.1471-0528.1987.tb02366.x. PMID 2952161. ^ a b Brüggmann D, Tchartchian G, Wallwiener M, Münstedt K, Tinneberg HR, Hackethal A (November 2010). "Intra-abdominal adhesions: definition, origin, significance in surgical practice, and treatment options". Deutsches Arzteblatt International. 107 (44): 769–75. doi:10.3238/arztebl.2010.0769. PMC 2992017. PMID 21116396. ^ a b c Brüggmann D, Tchartchian G, Wallwiener M, Münstedt K, Tinneberg HR, Hackethal A (November 2010). "Intra-abdominal adhesions: definition, origin, significance in surgical practice, and treatment options". Deutsches Arzteblatt International. 107 (44): 769–75. doi:10.1007/s10397-007-0338-x. PMID 21116396. ^ Lower AM, Hawthorn RJ, Clark D, Boyd JH, Finlayson AR, Knight AD, Crowe AM (August 2004). "Adhesion-related readmissions following gynaecological laparoscopy or laparotomy in Scotland: an epidemiological study of 24 046 patients". Human Reproduction. 19 (8): 1877–85. doi:10.1093/humrep/deh321. PMID 15178659. ^ Ahmed K, Keeling AN, Fakhry M, Ashrafian H, Aggarwal R, Naughton PA, Darzi A, Cheshire N, Athanasiou T, Hamady M (January 2010). "Role of virtual reality simulation in teaching and assessing technical skills in endovascular intervention". Journal of Vascular and Interventional Radiology. 21 (1): 55–66. doi:10.1016/j.jvir.2009.09.019. PMID 20123191. ^ Nar AS, Bawa A, Mishra A, Mittal A (July 2014). "Role of Diagnostic Laparoscopy in Chronic Abdominal Conditions with Uncertain Diagnosis". Nigerian Journal of Surgery. 20 (2): 75–78. doi:10.4103/1117-6806.137301. PMID 25191097. ^ Palmer R (1947). "[Not Available]". Gynecologie et Obstetrique. 46 (4): 420–31. PMID 18917806. ^ Bhattacharya K (January 2007). "Kurt Semm: A laparoscopic crusader". Journal of Minimal Access Surgery. 3 (1): 35–6. doi:10.4103/0972-9941.30686. PMC 2910380. PMID 20668618. ^ Clarke HC (April 1972). "Laparoscopy--new instruments for suturing and ligation". Fertility and Sterility. 23 (4): 274–7. doi:10.1016/S0015-0282(16)38886-0. PMID 4258561. ^ Tarasconi JC (October 1981). "Endoscopic salpingectomy". The Journal of Reproductive Medicine. 26 (10): 541–5. PMID 6458700. ^ Semm K (March 1983). "Endoscopic appendectomy". Endoscopy. 15 (2): 59–64. doi:10.1055/s-2007-1021466. PMID 6221925.